Home | Crafting | Cards | Oooh, it’s Lawn Fawn’s Snow Day! I can not tell you how excited I was when Laurie from The Creative Escape let all her old designers know that she needed help with new displays for the store. I’ve been kind of reclusive since LOAD, well, we all know how I love LOAD. There have been so many problems at home. Honestly, we switched schools yet again, and I don’t know how, but our problems are seemly… Gone. Yep, gone. It’s crazy, and my petty cash pot is empty, but Sean is finally THRIVING. Finally. 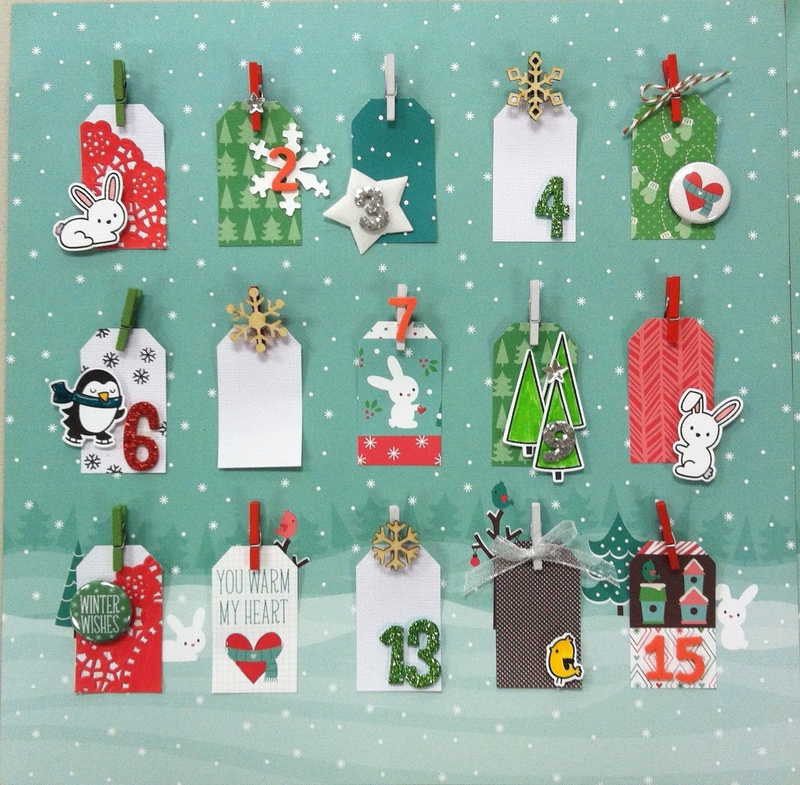 I was super inspired by Karen’s Advent Calendar, and thought, I could really show case the dies, and show where you could place pictures of your child, dog, husband, self, throughout the month. Then I started making the tags (I used my EK Success Tag Large Punch). I got so EXCITED! They were so cute! The bunnies, the penguins, even the trees! What was beyond great was that you could really show how versatile those dies are… You can stamp on patterned paper, you can stamp on flat card stock, you can stamp on textured card stock. Once you cut out the shapes, you can color or you can use a technique… Like fun flock or glitter! I really like the bunnies on kraft, and you put a bit of fun flock on that cute little tail, and WOW! What I also loved about this project is that I could use TONS of Thickers. I just love Thickers, and I think I used six (6) different styles of Thickers. Did you notice the stars? Those are Tim Holtz, and dang, I wish I had 2 packs? I used so many, and I let Vivian borrow a few for her project. What fun we had crafting together! I had created page 1 of the layout at home with Lei and Serena. I didn’t feel comfortable taking it on the plane going to Vegas with Vivian, so I worked off a picture. I absolutely adore how the title came out. I really wanted to work with a different background paper, but this one really worked out. I love the way the title looks like a red snow drift. You have no idea how proud I am of this project. And, I’m going to duplicate it this year with pictures of Sean in it. The cluster is something that I really wanted to do with this project. I used to cluster all the time, but I haven’t done it recently. This LO really needed a cluster on December 25. See those kraft bunnies, told you! So cute! I also made 8 cards. They will be in the next post. I hope you are just as inspired by this paper line as I was!